It was still summer, technically. But there was a stiff, fall breeze coming off the lake, letting her feel the small pleasure, and protection, of her sweater's warmth, as he walked along beside her. A camera hung around her neck and bobbed against her sternum as they took another turn around the dock. "What's that?" he said, pointing up at the sky. She followed his arm. "Another vulture, I think." Well, no. The truth was that she'd been too distracted by his nearness to put her mind on much else. But no. A vulture wouldn't reflect the sun's light like that. "A hawk, maybe?" she said, coming to a stop and shielding her eyes. "Or an osprey?" "Too big," he said, looking with her as the bird skirted the gap in the clouds. "Wait," she said, reaching for his arm. "I think it's a bald eagle." They stood like that, with her hand on his forearm, for a full minute of silence. The giant bird turned and leveled, turned and leveled. She was conscious of the feel of his flannel on her fingertips, the camera's weight around her neck, an exquisite breeze just lifting her hair. "Don't you want to take a picture?" She turned to him, and with her other hand, dutifully pressed the button on the camera hanging around her neck. He lifted an eyebrow, wonderingly. "I don't need a picture of it," she explained, sliding her arm through his and watching the eagle dive at the lake with a sudden, spearing intention. "I just want to remember, like this." The title translates to "Humanity Washed Ashore." The story is here. I'm sorry for the photo. I know it's crushing. It crushed me. We shouldn't need photos like this to make us act, but I think a good many of us probably do. (A different, happier Syrian refugee story reinforced this truth earlier in the week.) 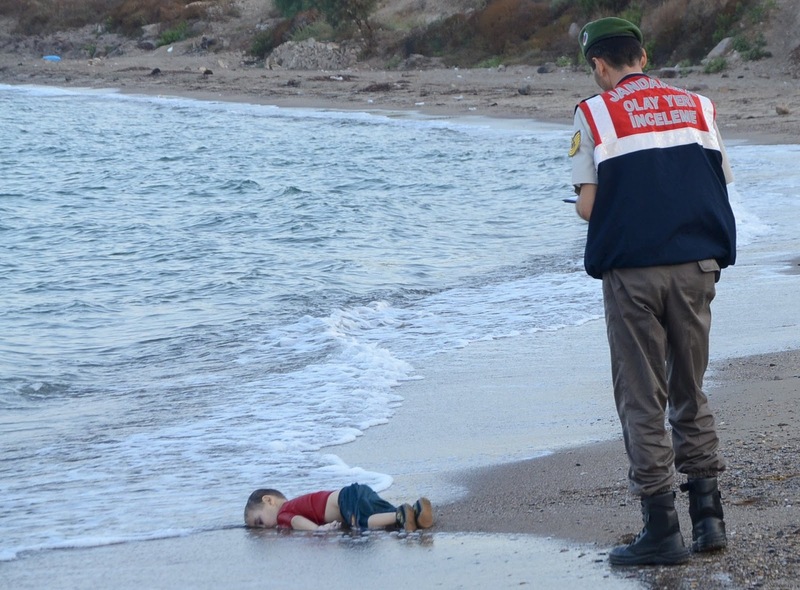 This boy, Aylan Kurdi, was one of thousands of Syrian refugees trying to flee Turkey for Greece, the gateway to the European Union. These are desperate people needing relief in a way I can't begin to comprehend, or impact. All we could think to do was donate money to the International Rescue Committee, a highly-regarded charity dedicated to helping refugees worldwide. If you'd like to do the same, please click here.